US Compliance Academy – Dealership education and employee oversight of federal mandates through on-line learning. The USCA offers Compliance Solutions, while Maintaining Profits. 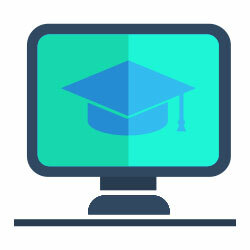 The utilization of online training and information sharing, to navigate the alphabet soup of multiple federal government agencies, and the regulations they enforce. Providing online certification for the entire Dealership staff, with regards to compliance mandates. Providing Dealerships and Agents with industry leading products and services. Dealerships and Agents across the U.S. add our ever-growing family of products and services to their already existing offerings. We trust that you will learn extensively about the various compliance mandates that every dealership must comply with, and we hope you will enjoy the information and courses. As several dealerships have recently recognized: A failure to comply with Federal compliance mandates, and/or employee misunderstanding and lack of acknowledgment of regulatory mandates, could be placing the dealership at a perilous risk! Is your dealership truly prepared? The USCA Certified Pre-Owned (CPO) RV Program will provide your dealership and sales professionals with a top-notch CPO Program. Discover how to elevate your pre-owned inventory sales, just as thousands of dealerships nationwide have over the past few years. After having a professional relationship with Charles Campbell, and his staff, for over ten years, I have come to respect the advice and knowledge that his team provides. The manner in which his staff provides compliance information and training is very easy to understand and follow. Charles provides a relaxed, and easy to understand, approach to the maze of complex federal laws and mandates. He doesn’t approach compliance issues from a “Fear” standpoint. And I would recommend his F&I education and consultation to any dealership that desires to maintain a compliant operation, while increasing their F&I profitability. After having a professional relationship with Charles Campbell, and his staff, for over ten years, I have come to respect the advice and knowledge that his team provides. Broadmoor RV Superstore has maintained an ongoing professional relationship with Charles, and his staff, for many years. Their top-notch compliance, F&I and overall dealership education and training programs have proven invaluable. Along with the exemplary ancillary products and services they continuously vet and research for us to allow our customers to receive the best protection packages available in our industry, we proudly endorse their business expertise. OFAC Search is an online Search tool dedicated to making a FREE advanced search algorithm available to everyone, not just large corporations. Now you can search the OFAC SDN list without the need of expensive compliance software. 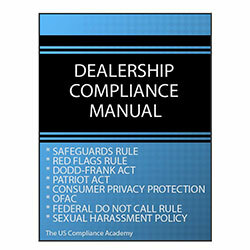 The US Compliance Academy is please to provide our Dealership Clients with the following downloadable forms. These forms are all to be considered as proprietary ownership of The US Compliance Academy, and therefore shall only be utilized by Dealership Staff in their everyday functions as they perform their official duties assigned by the Dealership Management Team. Generally, any person in a trade or business who receives more than $10,000 in cash in a single transaction or in related transactions must file a Form 8300. The Form 8300 provides valuable information to the Internal Revenue Service and the Financial Crimes Enforcement Network (FinCEN) in their efforts to combat money laundering.